People everywhere are starting to wake up, turn off their TVs, and tune in to the revolutionary power of video with TED Talks. If you haven’t heard about Ted.com, I would like to introduce you to a resource that will open your mind to a million new brilliant ideas that are changing the world, and it will improve your English. 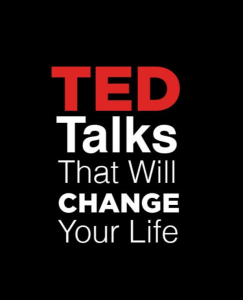 TED talks are captivating 18 minute presentations about some of the most intriguing topics of our time, on a vast variety of intelligent topics, presented by some of the world’s leading specialists from various fields, including many Nobel Prize Laureates and famous authors. TED has an ocean of spectacular information that will transform the way you look at the world, and if you give it a chance, you will see why their slogan is “ideas worth spreading.” TED Talks are definitely contagious, as you will feel motivated to share inspiring videos with friends and family so the people around you learn too. For English learners, the coolest thing is that nearly all presentations are in English, with subtitles in English (and nearly every other major language so you can share with almost anybody), and they are free and available to anybody with an internet connection. Real Life English is always talking about integrating English into your life in a fun, practical, and convenient way. So, although Ted.com is not specifically designed for English learners, we strongly believe that it is one of the best learning tools for ESL students. In addition to the impressive selection of TED Talks specifically about language learning, all videos are in English with English subtitle options (as well as most other major languages). It also have an interactive transcript (text from the presentation), which permits you to click on any part of the talk and it takes you directly to that part of the talk to watch. This means that you have an almost endless supply of smart and entertaining English speaking videos at your fingertips. The last time I checked, there were more than 1,400 official TED Talks on their web site, offering high quality and engaging practice for your English. The more you watch these videos, the more you get addicted, the easier it is to make a daily habit of it. The best way to develop true, lifelong English fluency is to make it a daily practice, and TED inspires you to do just that! As I wrote in last week’s article, 19 TED Talks That Will Transform Your Language Learning and Your Life, TED has had a big impact on my life. In the few months since I replaced my TV watching habits with these short video presentations, my mind has been flooded with amazing new ideas. I feel more creative, more optimistic about the world, and my perspective on the world is expanding. I’ve also started to discover how important it is to consider where you get your information, the quality and integrity of it, and how it effects your perception of reality. If you change your source information, you will most certainly change the way you perceive the world. If you want to understand the current landscape of international conflict, politics, and what people in any nation believe, have a look at the media in any given place. The corporate media in any country is a small group of the wealthiest .01% of the population who controls your information, and they don’t tell you the whole truth. This is how the masses are manipulated. Diversifying your information is the best thing you can do, but it takes an internet connection and a proactive attitude. The more you open your eyes and mind to different sources of good and intriguing information, the more your cultivate a dynamic new perspective on the world. The mark of intelligence is curiosity, and we are moving into the era of global interconnectivity. A global perspective is an essential tool for creating a better world. The thing I love most about Ted is that it facilitates a global perspective. This is important not only for English fluency. It’s important to being a world citizen. You see, when you learn a language, you are not just learning a rigid set of grammar rules. You are, in fact, learning to look at the world with new eyes. To do this, you need to expand, or elevate your perspective. Ted talks are a dynamic new form of infotainment (information + entertainment) that comes from a world perspective, and if we participate in this cultural space regularly, this becomes part of us and we start looking at the world with new eyes. This doesn’t mean that we lose our respective cultural identities. It just means that we have to open our minds to many new points of view, and the degree to which we can do this is the degree to which we become global citizens. This is not just excellent for your English fluency, it is exactly the type of thinking we need to develop on a mass scale in order to solve our international problems. The golden opportunity here is that when we start to use our English to participate in a global community, and expand our perspectives to include other cultures, we start to see English not as something external to be acquired, but as a natural extension of a new identity that each of us has to embrace. Speaking a language is much easier when we already have a cultural understanding of each other. TED Talks are revolutionary because they are the first massively popular media resource to promote a global perspective, and this is exactly the level of thinking and communication we need in order to wake up and start solving our international problems together. The current options provided by most TV stations are just not doing this. To give you a taste of what I’m talking about, here are a few of my favorite. Also, again, I would like to invite you to check out the article I wrote last week, 19 Ted Talks That Will Transform Your Language Learning AND Your Life. It will expand your perspective on the world and you will gradually start feeling like a global citizen. You will start looking at your own country with new eyes, and you will be able to see how the rest of the world sees your country. You will drastically improve your English and your process will feel more natural. You will be exposed to countless brilliant new ideas that improve your life, and feel motivated share them with your friends and family (with subtitles and interactive transcript in your language). As you first develop the habit of watching TED Talks, you may sometimes feel distracted and tired, and unmotivated to continue. Part of the reason for this is because you have to adapt to an advanced level of English, as well as the habit of consuming a higher density of quality information. Your brain needs to adjust. Like learning another language, adapting another worldview can be challenging and tiring. TED Talks are very entertaining, but they are powerful and packed with information. If you’re like most people, you have a lifelong habit of consuming “junk” information and entertainment, like you find on most TV stations. But TED is your chance to reinvent your English and reinvent your life. We also are consistently sharing TED talks in the Real Life English International Community and RealLifeEng on Twitter. We’d love to see you there! In the meantime, here are 15 Ted Talks that have impacted me in a big way. Description: At his Stanford University commencement speech, Steve Jobs, CEO and co-founder of Apple and Pixar, urges us to pursue our dreams and see the opportunities in life’s setbacks — including death itself. Bio: As CEO of Apple, Steve Jobs spearheaded a few of the most iconic products in technology, entertainment and design. Bio: In 2009, Simon Sinek released the book “Start With Why” — a synopsis of the theory he has begun using to teach others how to become effective leaders and inspire change. Description: Brené Brown studies human connection — our ability to empathize, belong, love. In a poignant, funny talk, she shares a deep insight from her research, one that sent her on a personal quest to know herself as well as to understand humanity. A talk to share. Bio: Brené Brown studies vulnerability, courage, authenticity, and shame. Description: Body language affects how others see us, but it may also change how we see ourselves. Social psychologist Amy Cuddy shows how “power posing” — standing in a posture of confidence, even when we don’t feel confident — can affect testosterone and cortisol levels in the brain, and might even have an impact on our chances for success. Bio: Amy Cuddy’s research on body language reveals that we can change other people’s perceptions — and even our own body chemistry — simply by changing body positions. Description: Dan Gilbert, author of “Stumbling on Happiness,” challenges the idea that we’ll be miserable if we don’t get what we want. Our “psychological immune system” lets us feel truly happy even when things don’t go as planned. Bio: Harvard psychologist Dan Gilbert says our beliefs about what will make us happy are often wrong — a premise he supports with intriguing research, and explains in his accessible and unexpectedly funny book, Stumbling on Happiness. Description: Buddhist roshi Joan Halifax works with people at the last stage of life (in hospice and on death row). She shares what she’s learned about compassion in the face of death and dying, and a deep insight into the nature of empathy. Bio: Known for her compassionate work with the terminally ill, Joan Halifax is a driving force of socially engaged Buddhism. Description: On the web, a new “Friend” may be just a click away, but true connection is harder to find and express. Ze Frank presents a medley of zany Internet toys that require deep participation — and reward it with something more nourishing. You’re invited, if you promise you’ll share. Description: Scott Dinsmore’s mission is to change the world by helping people find what excites them and build a career around the work only they are capable of doing. He is a career change strategist whose demoralizing experience at a Fortune 500 job launched his quest to understand why 80% of adults hate the work they do, and more importantly, to identify what the other 20% were doing differently. Description: JR, a semi-anonymous French street artist, uses his camera to show the world its true face, by pasting photos of the human face across massive canvases. At TED2011, he makes his audacious TED Prize wish: to use art to turn the world inside out. Learn more about his work and learn how you can join in at insideoutproject.net. Bio: With a camera, a dedicated wheatpasting crew and the help of whole villages and favelas, 2011 TED Prize winner JR shows the world its true face. Description: In 2003, the Palestinian village of Budrus mounted a 10-month-long nonviolent protest to stop a barrier being built across their olive groves. Did you hear about it? Didn’t think so. Brazilian filmmaker Julia Bacha asks why we only pay attention to violence in the Israel-Palestine conflict — and not to the nonviolent leaders who may one day bring peace. Bio: Julia Bacha is the Media Director at Just Vision and the director and producer of “Budrus,” a documentary about a West Bank village, a giant barrier and nonviolent resistance. Description: Using examples from vacations to colonoscopies, Nobel laureate and founder of behavioral economics Daniel Kahneman reveals how our “experiencing selves” and our “remembering selves” perceive happiness differently. This new insight has profound implications for economics, public policy — and our own self-awareness. Bio: Widely regarded as the world’s most influential living psychologist, Daniel Kahneman won the Nobel in Economics for his pioneering work in behavioral economics — exploring the irrational ways we make decisions about risk. Description: Author and activist Isabel Allende discusses women, creativity, the definition of feminism — and, of course, passion — in this talk. Bio: Novelist Isabel Allende writes stories of passion. Her novels and memoirs, including The House of the Spirits and Eva Luna, tell the stories of women and men who live with passionate commitment — to love, to their world, to an ideal. Description: Career analyst Dan Pink examines the puzzle of motivation, starting with a fact that social scientists know but most managers don’t: Traditional rewards aren’t always as effective as we think. Listen for illuminating stories — and maybe, a way forward. Bio: Bidding adieu to his last “real job” as Al Gore’s speechwriter, Dan Pink went freelance to spark a right-brain revolution in the career marketplace. Description: A modern day renaissance man, Sol’s an Artist, Social Entrepreneur (ethical business), Artist Manager, Film and TV producer. Sol, a native of Canada, started his career as an MC and manager of the legendary Canadian hip hop group Rascalz. He then went on to work for Arista Records in New York City as director of International Artist Development. He began traveling the world, charting and propelling the development of Global Hip Hop gaining inspiration from the countries and cultures he visited. Description: What is adult life really about? In this legendary college commencement speech in 2005, David Foster Wallace attempts to explain. Animation by The Glossary. Bio: In his novels and short stories, and in sharp essays, David Foster Wallace paid careful attention to life, to the truth of being human. "TED has had a big impact on my life. In the few months since I replaced my TV watching habits with these short video presentations, my mind has been flooded with amazing new ideas. I feel more creative, more optimistic about the world, and my perspective on the world is expanding." "Matt Cutts: Try something new for 30 days". this idea really inspired me ^_^. Thanks Loay! I’m glad you are enjoying TED as much as me. I love the Matt Cutts talk too. I’m always recommending that one. It’s short, but sweet! Thanks for the nice comment. Take care. I loved all the videos. They are really amazing! That’s awesome that you enjoyed them, Nair! Thanks for comment. I`ve discovered Ted Talks a couple of days ago, and I can tell you it`s a very illuminating prospective program. I live in a very, very small city in Maranhao- Brazil, as you know we call here "interior". So, I was searching for radio stations in the tune in app. Well, guess what, I found this crazy radio station, called "Ted Talks", and I was thrilled because I have a very law internet speed, like 2G or something. I `ve just click it on a touch button, and you know what is amazing that you can listen to it LIVE. Yes, Ted Talks English on tune in app LIVE, on a 56 kbps stream. So for those who have a bad internet connection like me, listen and enjoy it. Justin, as always amazing article. So, why the name of the station "Ted Talks"? Thank you so so much that you shared this TED TALKS Link with me on the Facebook! This is just amazing. The videos are really motivating. You know what I had never thought in this way. This is absolutely new thing for me to listen to TED Talks & RealLife Podcast to improve my language in a creative way. I am truly thankful to you for your guidance. Hey Sonia, Great to hear from you. I’m glad you’ve found these TED Talks useful. If you thought that was powerful, try this article- I’ve listed my favorite TED Talks here- https://reallifeglobal.com/tedtalks/ Thanks for all your support and have a great day!